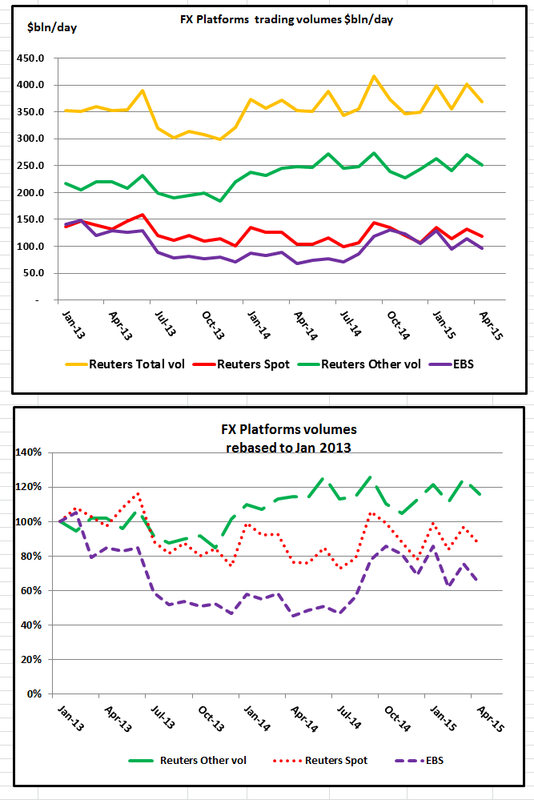 The major OTC FX platforms have now reported their April 15 volumes. All the platforms reported falls ranging from -2% for FastMatch to -15% for EBS, following strong gains in March. EBS $96.9bn/day in Apr, down a large -15.4% on Mar, and up +41.5% compared to Apr 14 level of $68.5bn/day. Reuters Spot: $118bn/day in Apr, down -10.6% on Mar, and up +13.4% compared to the Apr 14 level of $104bn/day. Reuters Other Products: $251bn/day in Apr, down -7% on Mar, and up +1.2% compared to Apr 14 level of $248bn/day. Reuters total: $369bn/day in Apr, down -8.2% on Mar, and up +4.8% compared to Apr 14 level of $352bn/day. HotSpot: $28.4bn/day in Apr, were down -10.1% on Mar, although still up -12.7% compared to Apr 14 level of $25.2bn/day. Hotspot FX was recently sold to BATS Global Trading, who have a reputation for low-cost execution, and have recently announced initiatives to drive down the costs of execution as the look to gain market share. FXCM Institutional total: $10bn/day in Apr, down -11.5% on Mar, and up +19% compared to Apr 14 level of $8.4bn/day. 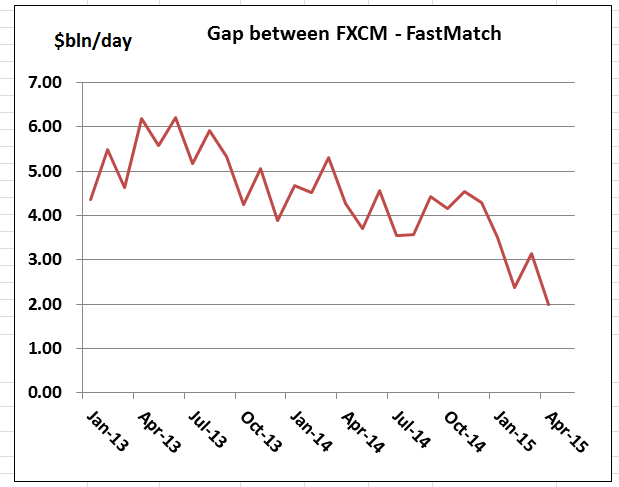 Fastmatch: $8bn/day in Apr, down a small -1.8% on Mar, although still an impressive +94.4% up compared to Apr14 level of $4.1bn/day FXCM which owns 30% of Fastmatch, is in the process of disposing of the stake as they divest of non-core assets. From the charts below, it looks like Reuters and EBS are pretty much moving in step change with each other. However, when we look at the difference between Reuters and EBS, we can see from the chart below that Reuters spot volumes have strongly outpaced EBS since Nov 14. And as mentioned last month, in terms of technical charts, it’s now hitting the downtrend line. 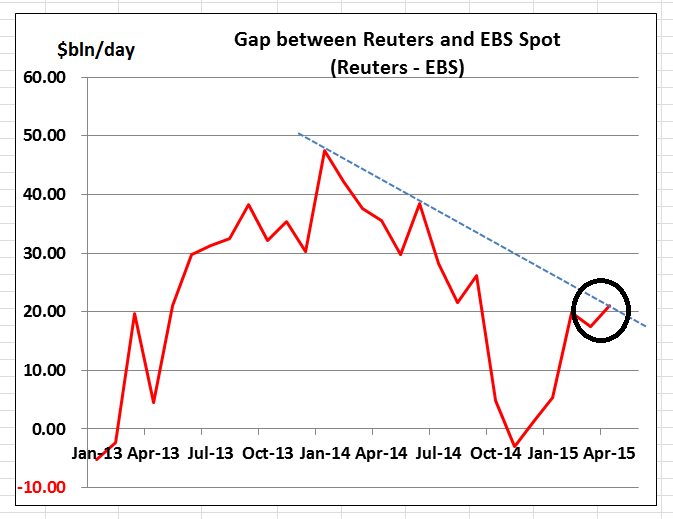 If it can break above the line, then we will see Reuters continue to win share over EBS, whilst a failure to do so, should see EBS volumes gain ground at the expense of Reuters. Now let’s look at the second tier of FX Platforms. 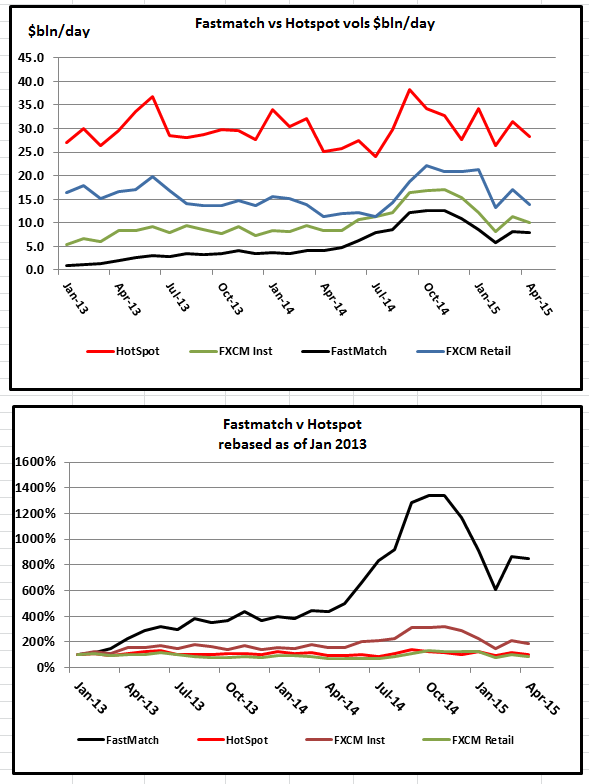 Hotspot, FXCM and Fastmatch. 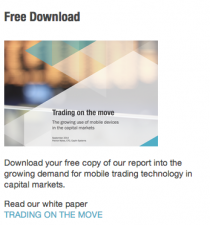 Although Fastmatch volumes are small compared to the other major platforms, they have shown strong growth and with FXCM divesting their 30% stake and a batch of new innovative product offerings being rolled out, it looks like Fastmatch could be due for further volume increases as it continues to gains traction.